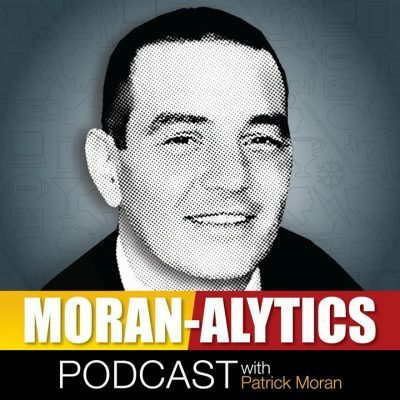 On this episode of the Moran-Alytics Podcast, Patrick Moran chats with ESPN Buffalo Bills beat reporter Mike Rodak about a handful of New England Patriots and Bills topics. Rodak was previously a guest on the podcast back last May (Episode No. 25) and then we learned plenty about Mike beyond his ESPN job, including his upbringing, education, career journey and his takes on a ton of sports media, social media and fun human interest topics. Today’s conversation is more to the point as Rodak weighs in on the Patriots perhaps now the greatest dynasty of all-time, not just in football but all of sports. He also has insight as to why the Patriots aren’t on the same popularity level as some of other all-time great dynasties in other sports, talks about what makes them nearly unstoppable, warns fans that they’re not going away anytime soon and offers his opinion on why we may not have seen the last of Gronk. Mike also has takes on a handful of Bills topics, including Lesean McCoy’s future with the team, what incumbent offensive lineman may be back in 2019 and a position the team may spend heavy resources on that most fans probably don’t expect. You can follow Mike on Twitter at @MikeRodak and check out his work at ESPN.com. Immediately after Moran is joined by his buddy Tone Pucks (@tonepucks) for another installment of “Pat with Pucks.” The two are complaining about the Super Bowl, a lackluster 2018 NFL season in general, the NBA owning a lot of Super Bowl week and a discussion about the ongoing Buffalo Sabres struggles. Also, Patti LaBelle, Human League and Culture Club somehow end up getting worked into the segment.